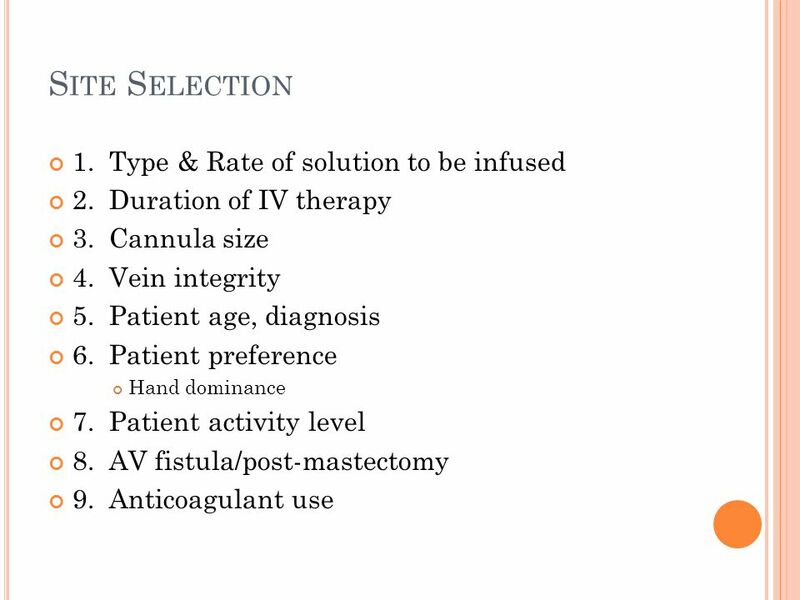 2 Initiating IV Therapy Prior to procedure Check Physician’s order ! 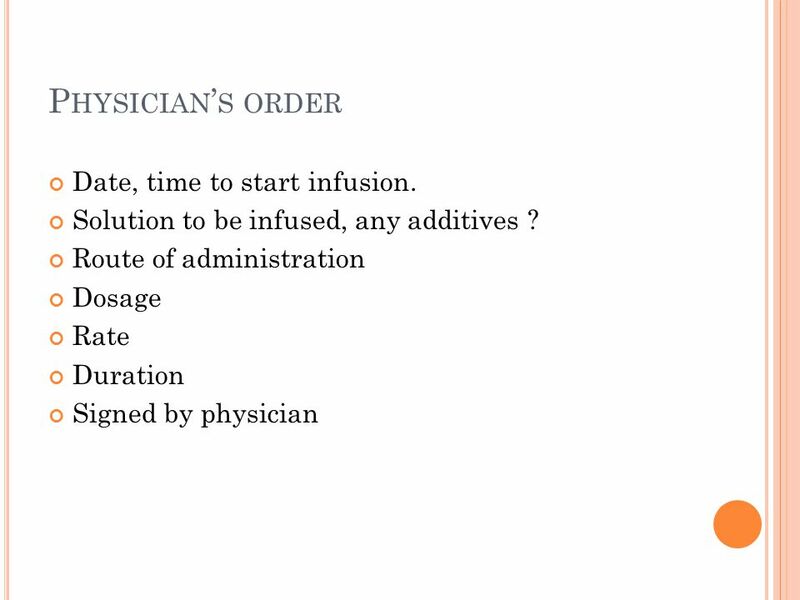 3 Physician’s order Date, time to start infusion. Solution to be infused, any additives ? 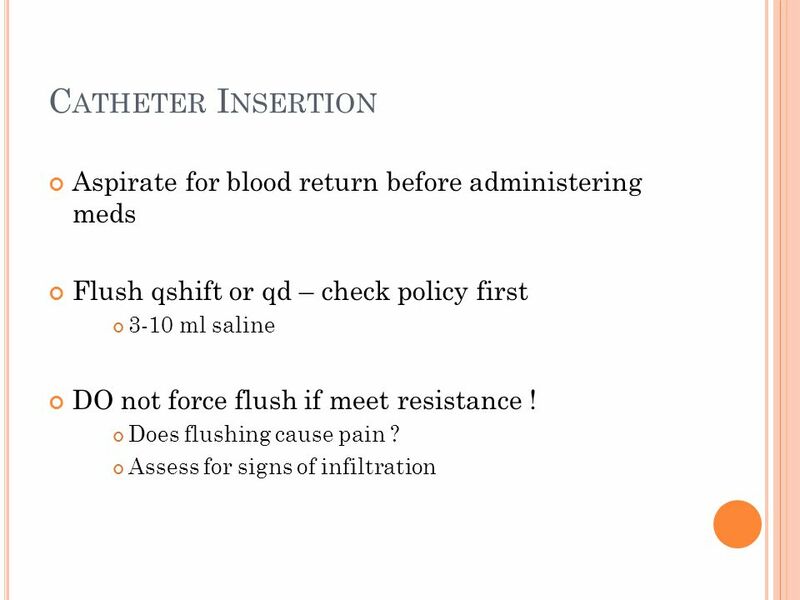 Route of administration Dosage Rate Duration Signed by physician Does it say IV? How much? 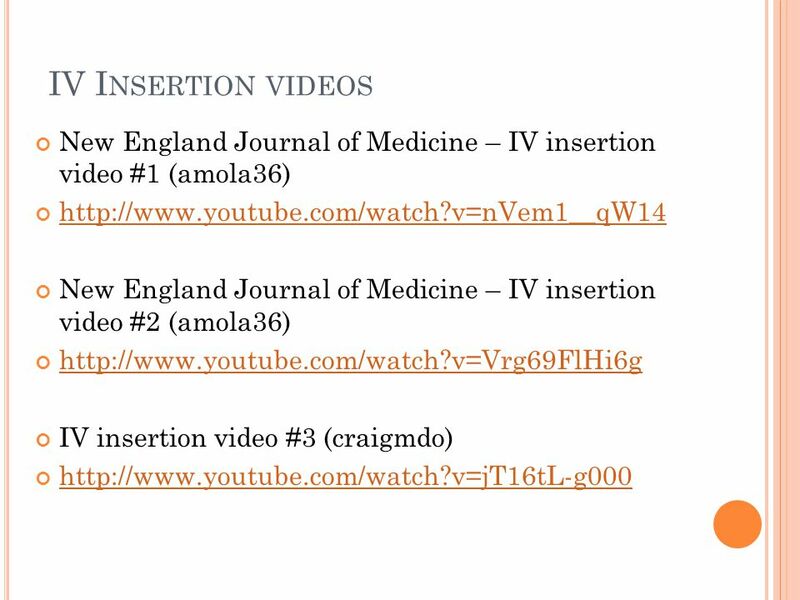 Even a straight IV has to say .45 NS or .9 NS How fast? 100cc/hr? Over 8 hrs? Indefinitely? Until bag complete? (Not always specified – you may need to check) Signature? Review sample orders on overhead - which ones are correct? 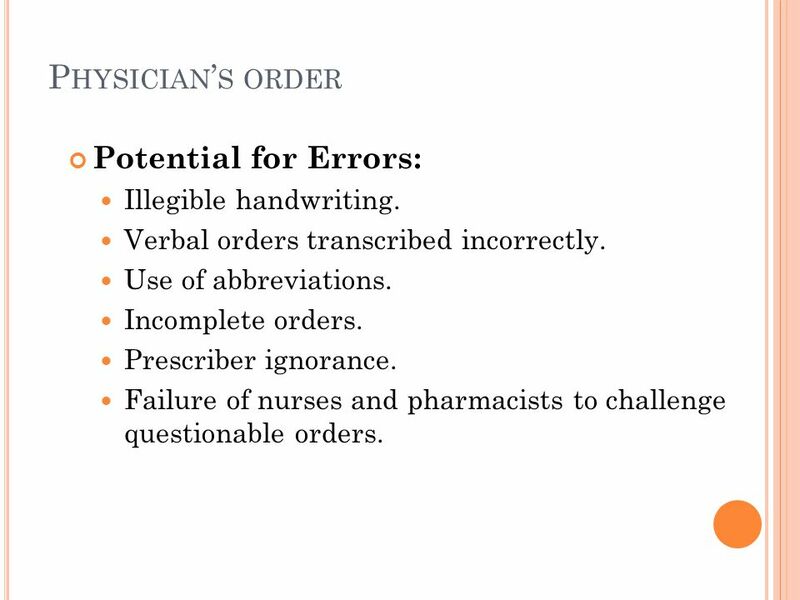 5 Physician’s order Potential for Errors: Illegible handwriting. Verbal orders transcribed incorrectly. Use of abbreviations. Incomplete orders. 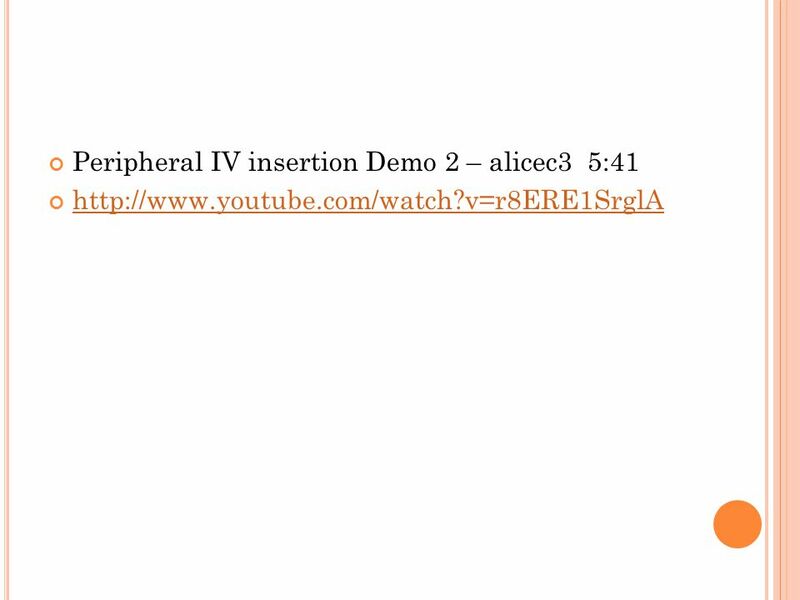 Prescriber ignorance. Failure of nurses and pharmacists to challenge questionable orders. 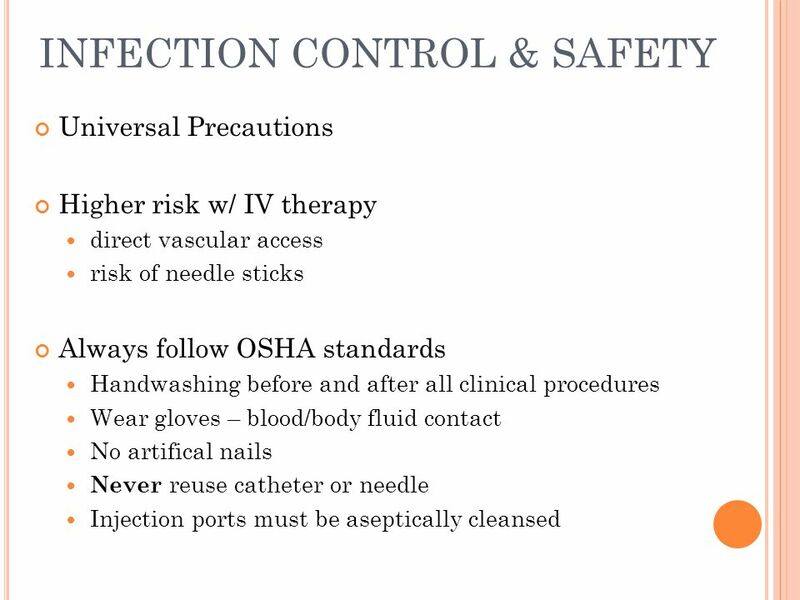 Universal Precautions Higher risk w/ IV therapy direct vascular access risk of needle sticks Always follow OSHA standards Handwashing before and after all clinical procedures Wear gloves – blood/body fluid contact No artifical nails Never reuse catheter or needle Injection ports must be aseptically cleansed Handwashing always before and after pt contact. Soap and water loosen debris, but alcohol based products are most effective and recommended for decontamination – vigorous min scrub. Gloves for ALL body fluids, after cleaning hands. 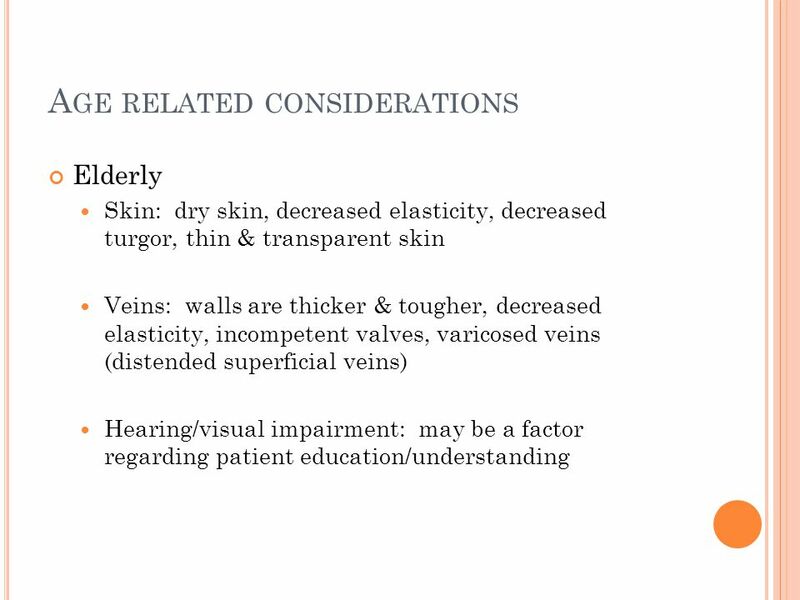 Universal precautions (“standard” is interchangeable)– these principles are maintained for ALL patients – thus “universal” Infection can be even more problematic w/ IV therapy since by its nature there is ALWAYS “exposure” since you have direct access to the vascular system. 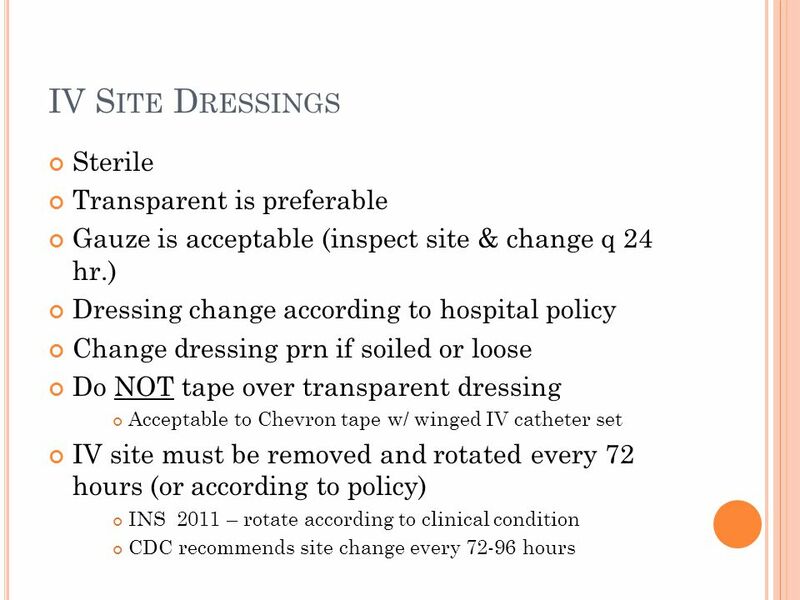 CDC “standard precautions” also include knowledge of the chain of infection………next slide…. 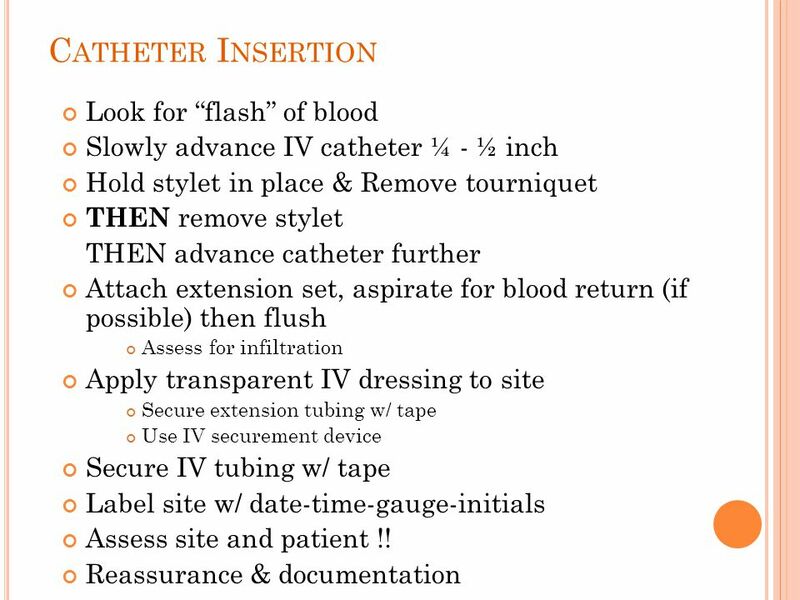 Insertion catheter/cannula (*radiopaque) Extension set and NS flush (5-10ml) Tourniquet (latex-free ?) 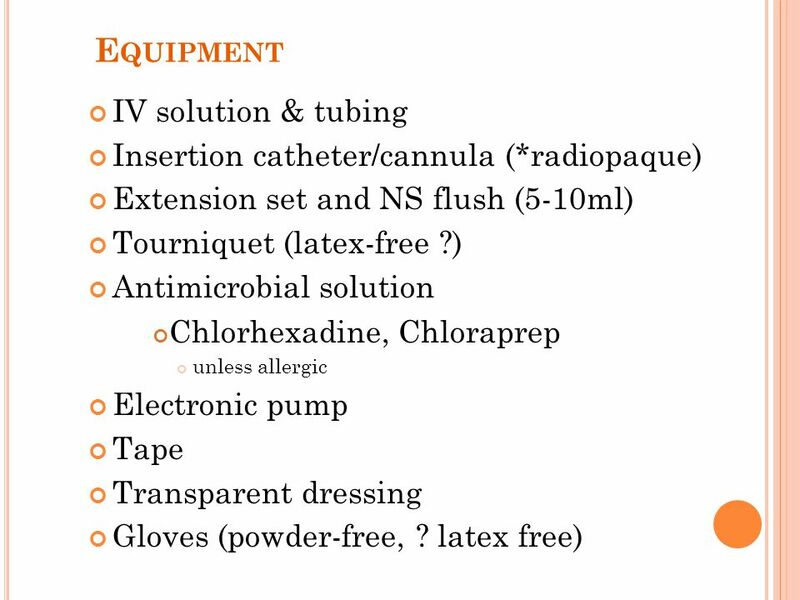 Antimicrobial solution Chlorhexadine, Chloraprep unless allergic Electronic pump Tape Transparent dressing Gloves (powder-free, ? latex free) Additional supplies at bedside ! Equipment – must be prepared. Once you start the procedure it is too late to try and run around to find things. 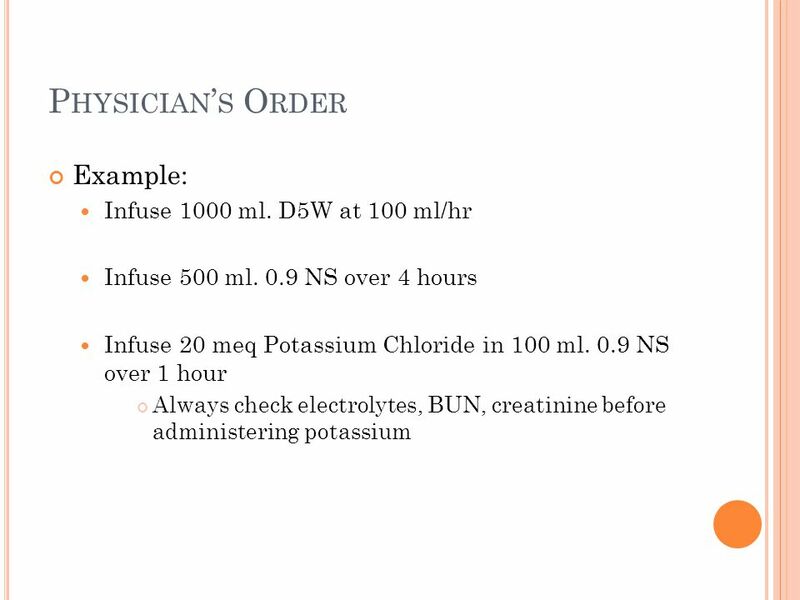 Remember – IV solution: Check the order for the correct solution. Proper size Should be clear and intact. Check expiration date – should be habit. Tubing: Must be appropriate and package intact. 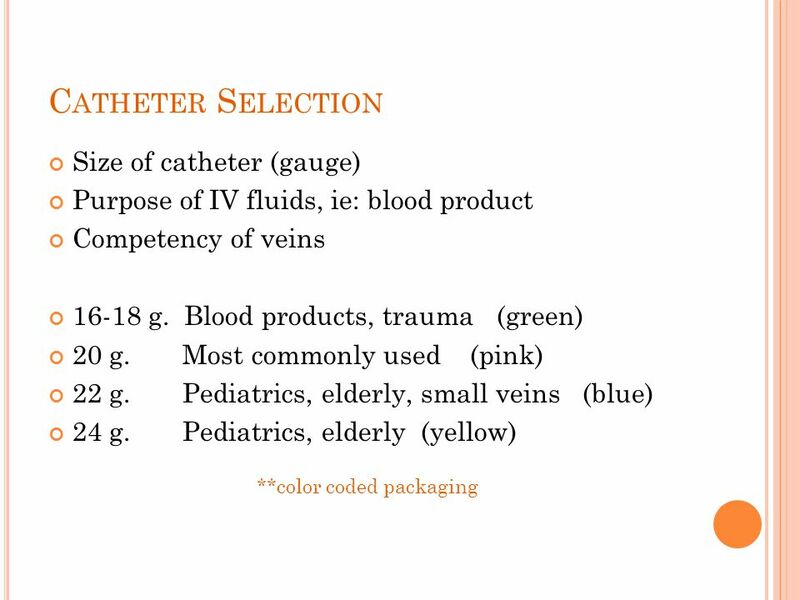 Primary tubing for continuous IV, Secondary tubing for piggybacks, and pump tubing if needed for electronics – we will talk about this more, but for right now PRIMARY tubing will be what we are referring to. 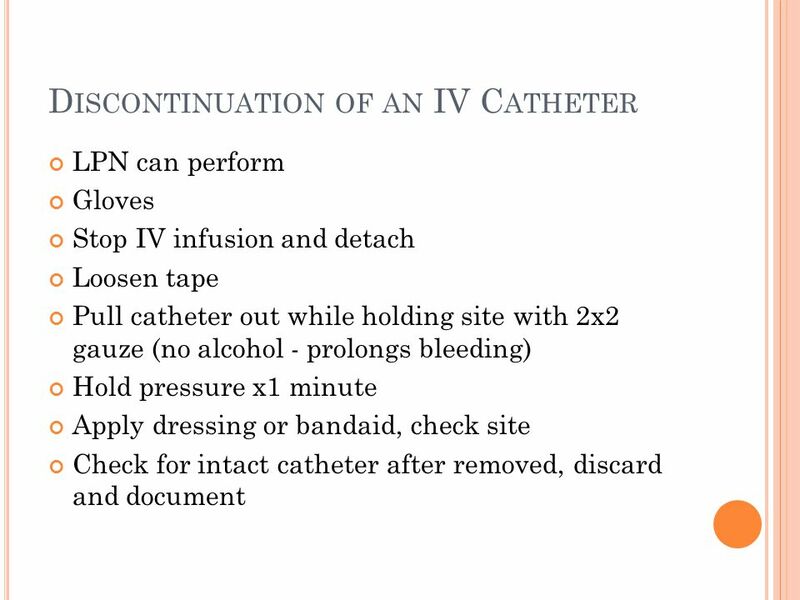 (Secondary is simply shorter and usually without injection ports) Appropriate catheter – we will discuss in detail. Tourniquet – try to use latex-free. 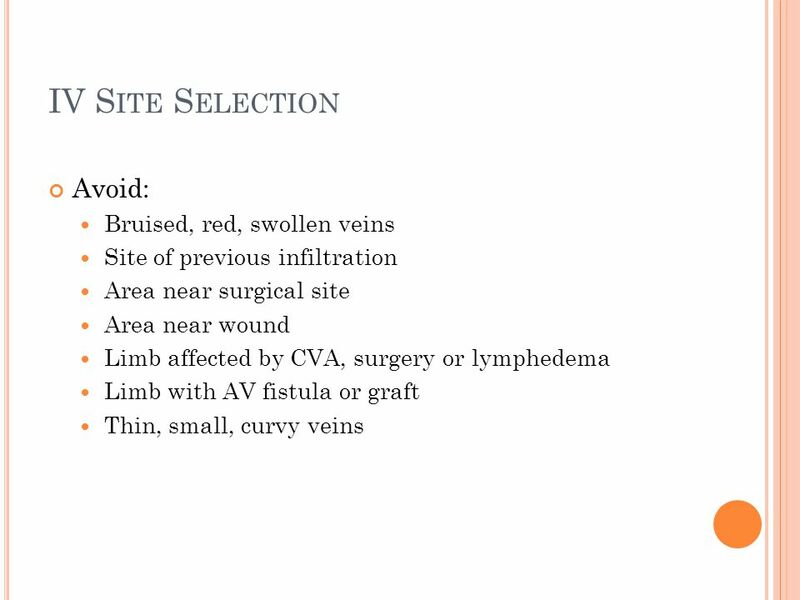 Alcohol, betadine, or chlorhexadrine are most typical. Do NOT use alcohol AFTER betadine – it negates the effect of the betadine. The choice of antimicrobials is institution – dependent. Many studies done. For the most part, alcohol is oldest and very effective, but doesn’t last long. Betadine is not fast-acting but lasts much longer. (Companies in the process of developing combo solutions). Chlorhexedrine is also approved, and some studies show this solution to be superior to alcohol or betadine. Pump – we will talk about later, but have it if you need it. 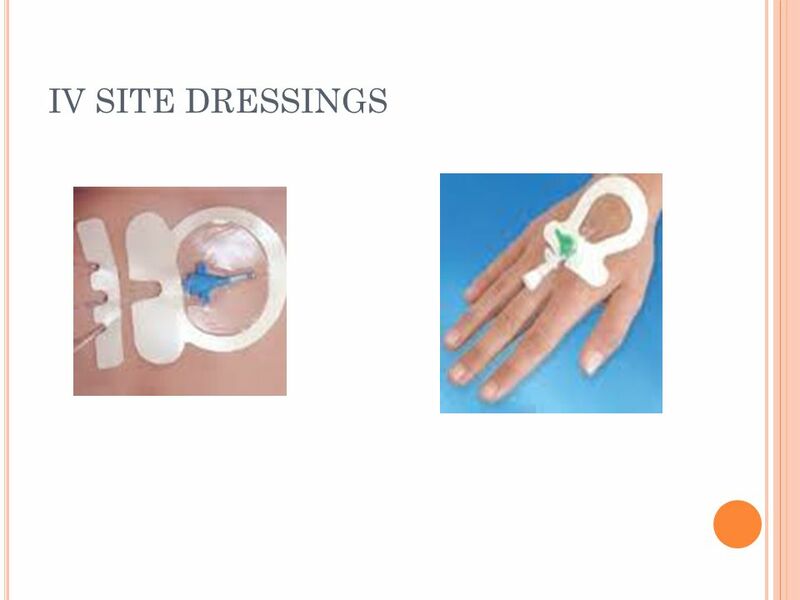 Tape Tegaderm (or other transparent dressing), so you can see site Gloves – INS recommends powder-free for IV insertion. Each piece of equipment will make sense as we go through the procedure. 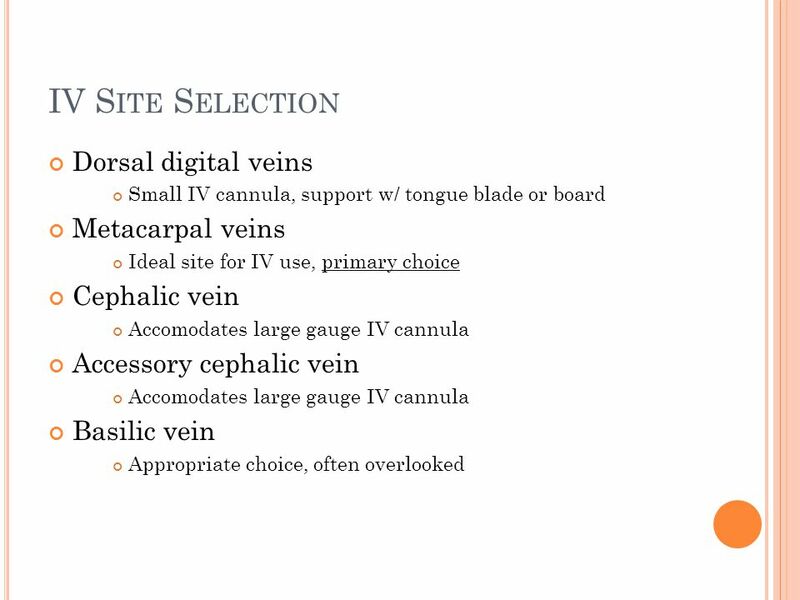 We will do this in detail in the lab, however I want to explain first how to choose a site and choose a needle or cannula before I explain the rest of procedure. Talk to your patient, explain & reassure Assemble equipment ahead of time, be organized !! 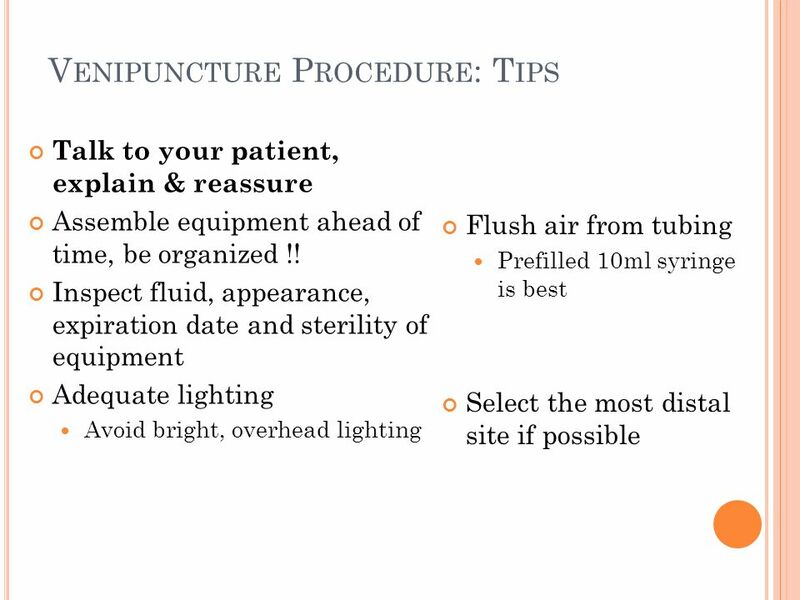 Inspect fluid, appearance, expiration date and sterility of equipment Adequate lighting Avoid bright, overhead lighting Flush air from tubing Prefilled 10ml syringe is best Select the most distal site if possible Assess intravenous (IV) devices and equipment for compliance with the Needlestick Safety and Prevention Act. 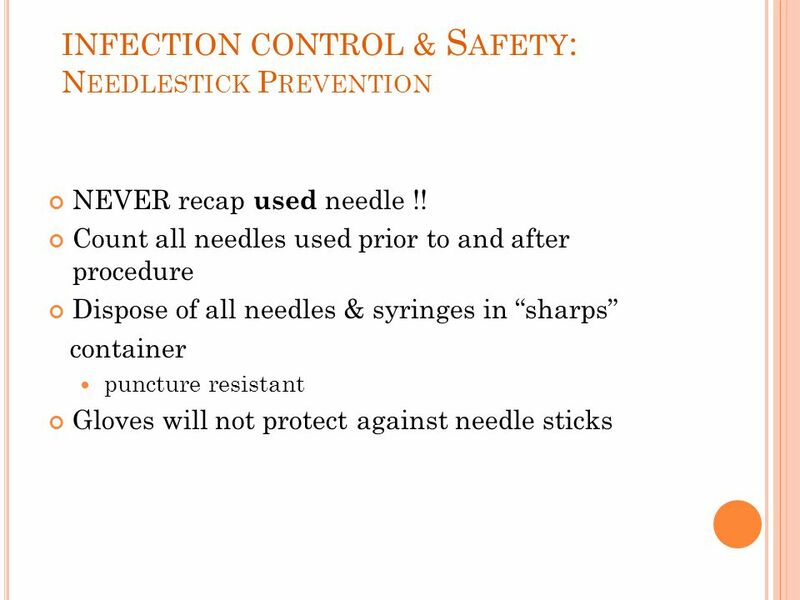 Note : The Needlestick Safety and Prevention Act requires the use of needleless systems for laboratory sampling, parenteral administration of medication or fluids, or any procedure carrying the risk of injuries from contaminated sharps and occupational exposure to bloodborne pathogens. 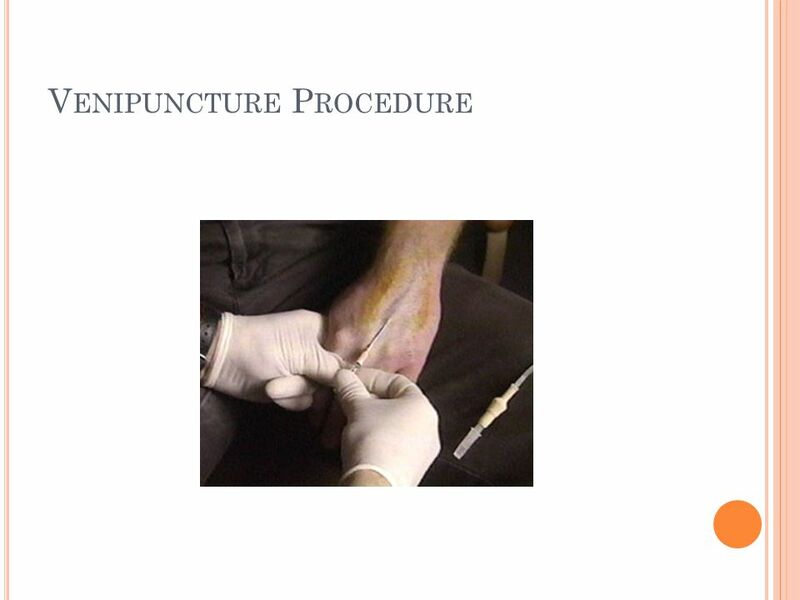 (Needlestick Safety and Prevention Act–HR 5178, Section 3, 2000.) Always dispose in sharps container. 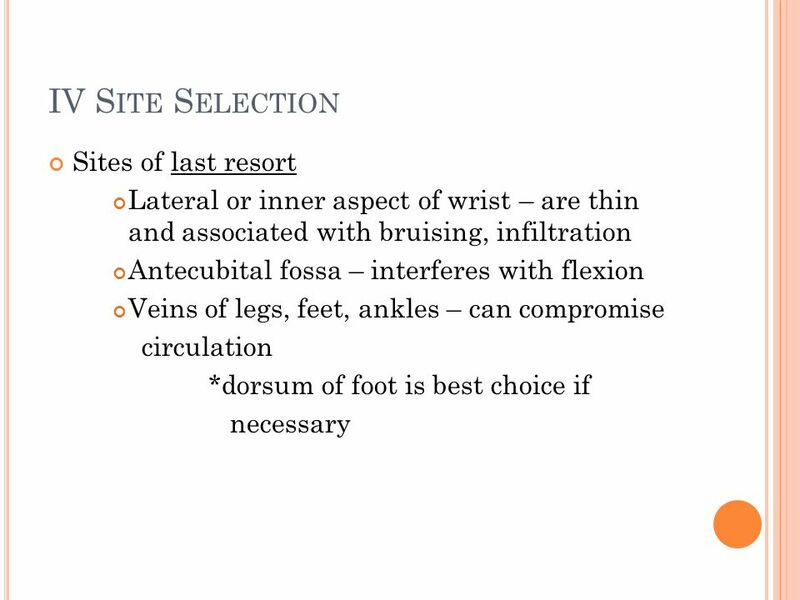 Next slide…. Excellent illustration of technique. Now – will practice in lab. ½ class will do computer tutorial, then will switch for next class. Need to practice on own. 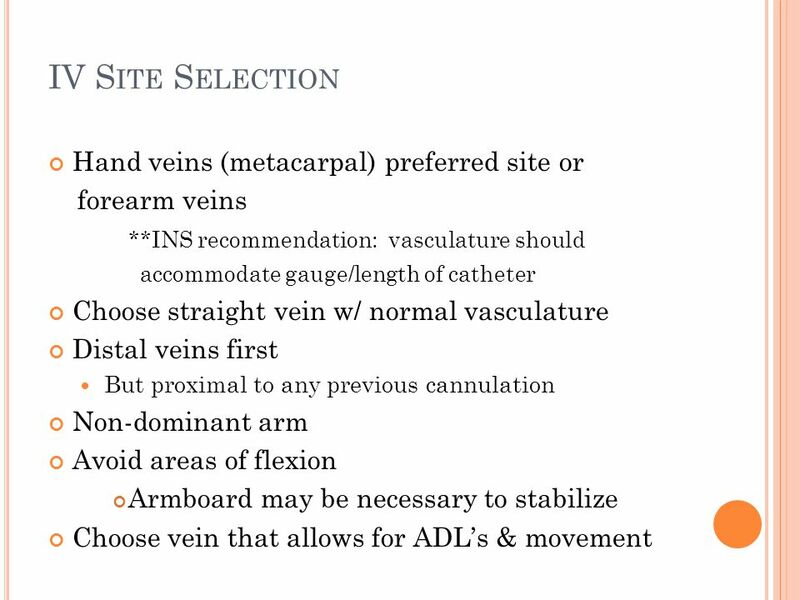 DATE/TIME (of insertion) LOCATION VEIN USED CATHETER SIZE (gauge used) INFUSION ( rate & solution; pump or grav.) 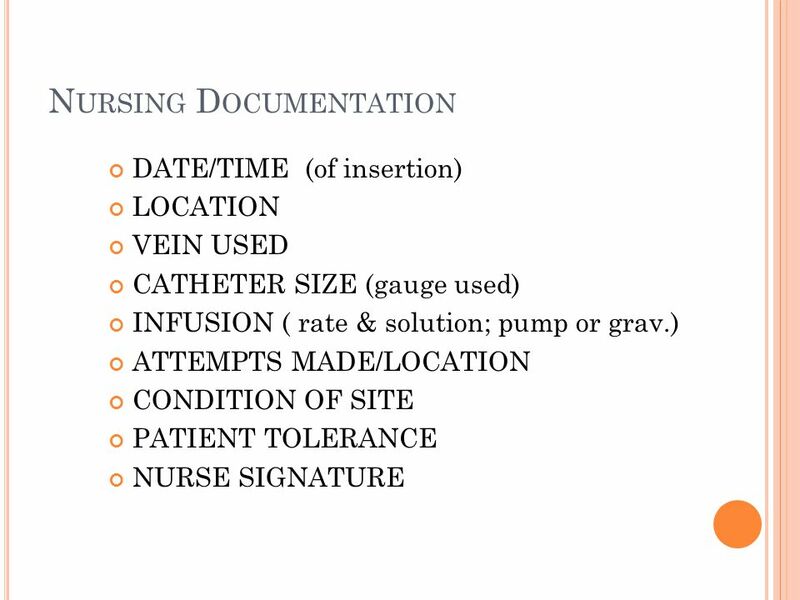 ATTEMPTS MADE/LOCATION CONDITION OF SITE PATIENT TOLERANCE NURSE SIGNATURE This is just an overview of essentials of charting – obviously anything that needs clarification or elaboration needs to also be documented. 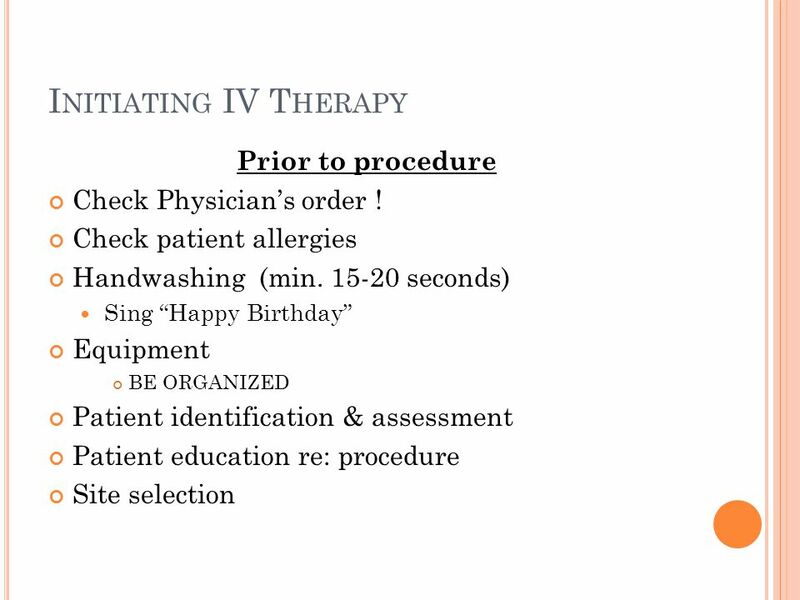 Download ppt "IV THERAPY: Initiating IV Therapy Part 3"
What do we already know? Standard Precautions – All specimens should be treated as if they are hazardous and infectious. p. 326 Phillips Asepsis Anatomy. 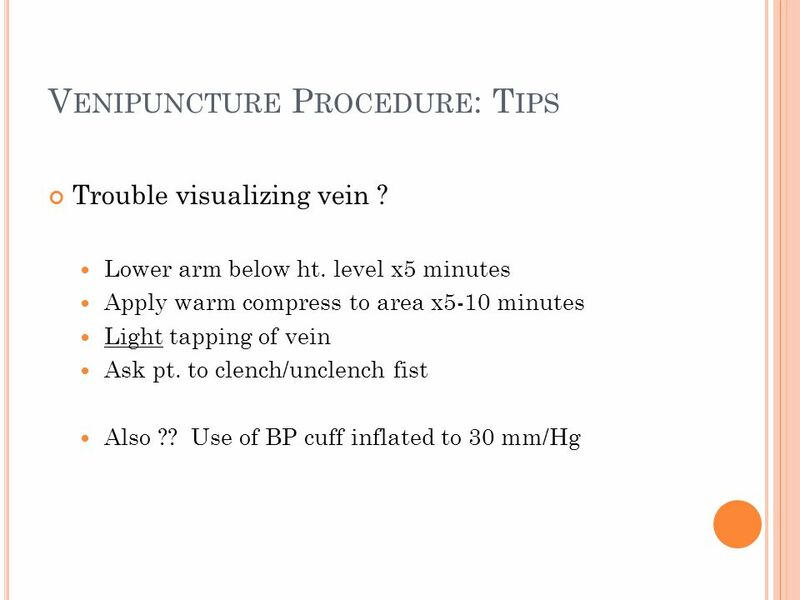 VENIPUNCTURE DMI 63. 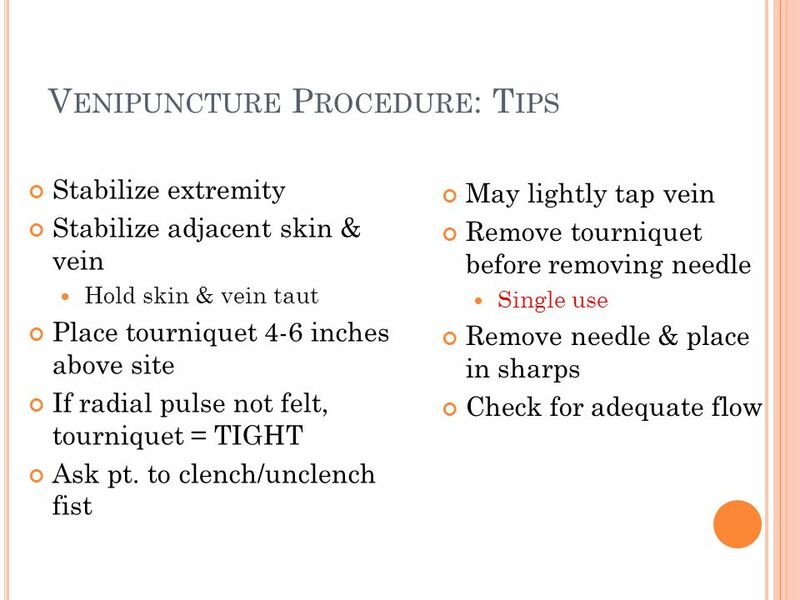 Senate Bill 571 Filed on 8/26/97 Allows technologist’s to perform venipuncture under general supervision of a physician Technologist. Carolyn McCune, RN, MSN, CRNP Teresa Peck RN, BSN. 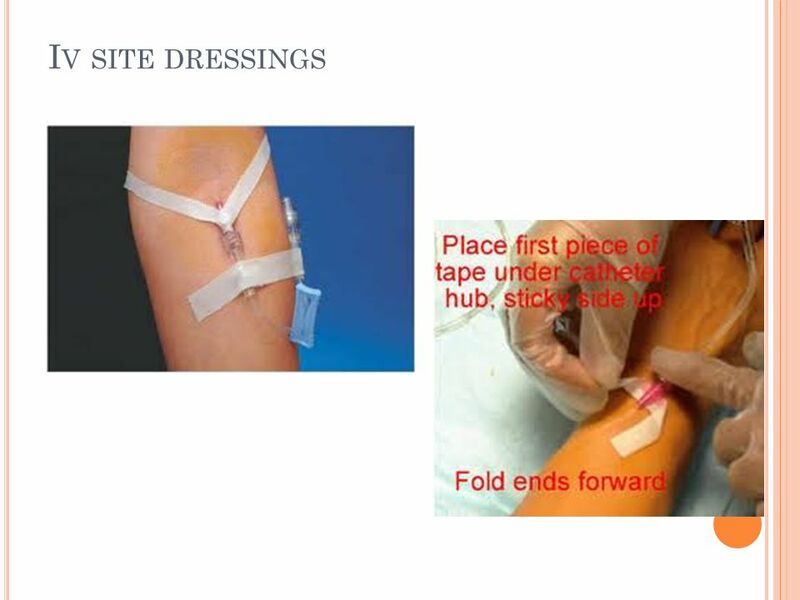 Blood Transfusion Nursing Procedure. *Whole blood transfusion replenishes the circulatories:  Volume  Oxygen-carrying capacity *Packed Red Blood Cells. PerSys Paediatric Bone Injection Gun B.I.G.. INTRAOSSEOUS ACCESS Penetration of the bone in order to access the intravascular compartment Device inserted. 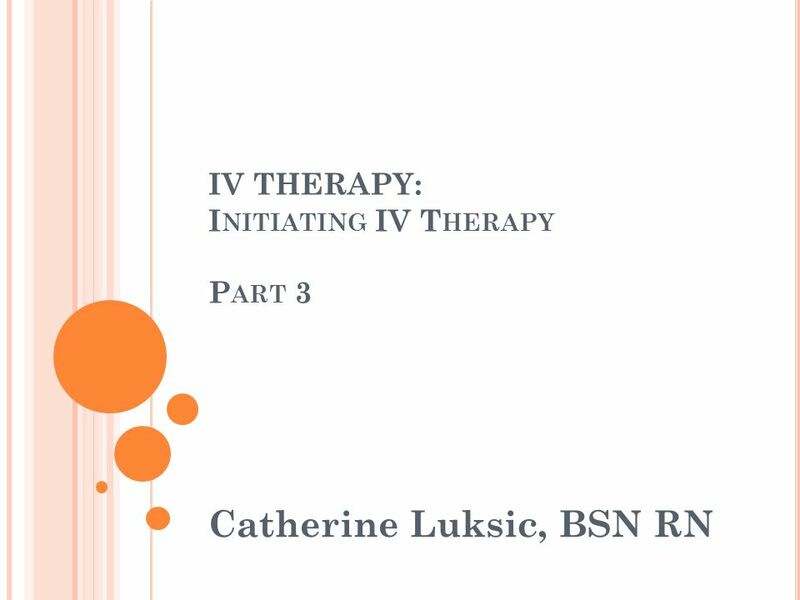 Monitoring and Documentation Principles of IV Therapy BSN336. 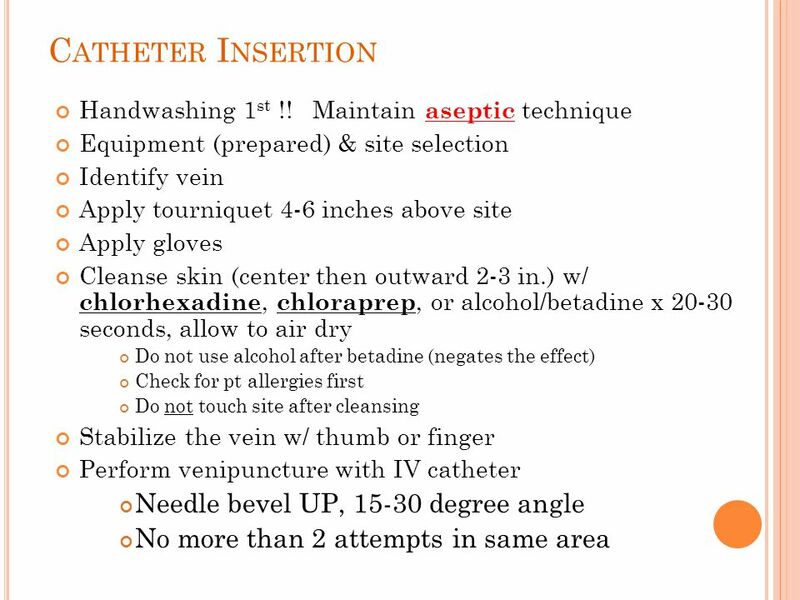 Starting a Peripheral IV Principles of IV Therapy BSN336 Lab.